COMPANY PROFILE The AES Corp is a power generation and utility company. It is engaged in providing affordable, sustainable energy through its diverse portfolio of thermal and renewable generation facilities as well as distribution businesses. AES is a global power company with businesses in 16 countries on four continents. It has a portfolio of more than 100 power plants and its current construction program will increase its net generating capacity to more than 35 GW. AES also has ownership interests in seven electric utilities in four countries providing power to more than 9 million customers. These businesses range from utilities providing only electric distribution to fully integrated ones with generation, transmission, and distribution. 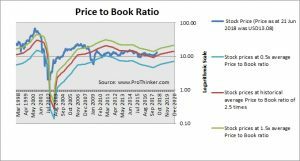 At the price of USD13.08 as at 21 Jun 2018, The Aes Corp is trading at a Price to Book Ratio of 3.1 times current book value. 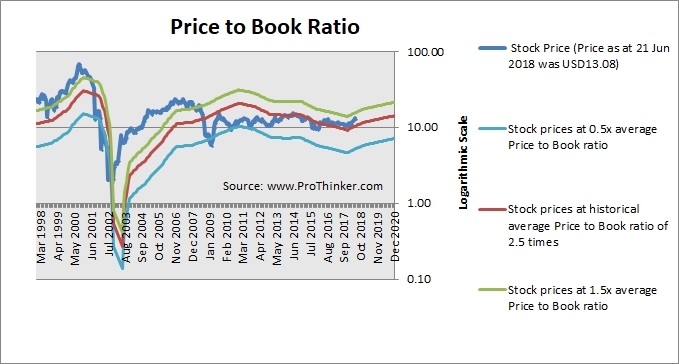 This is a 26% premium to its historical average Price to Book Ratio of 2.5 times.